It’s been six months, and both August and Kate made their choices. August is now a soldier in the fight against the monsters in Verity, and accepting his fate to cleanse the sinners among the humans. But no matter how hard he fights, the other side seems to get stronger. And for Kate, it seems no matter how much distance she puts between herself and Verity, the monsters keep following. In one of her missions to dispatch a monster in Prosperity, she comes across a new type, one that feeds on anger and violence. And as luck would have it, it’s new target is Verity City. 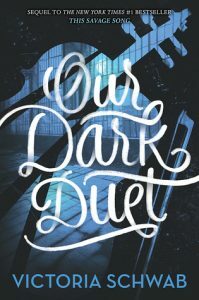 Personal Take: It’s been months since I’ve read Our Dark Duet, and I’m struggling to articulate how amazing and heart-wrenching this book was. It’s the characters, it’s the tension, it’s the world itself. The inner-conflict for both August and Kate is so raw and real. The stakes are high, it almost seems impossible to resolve. And yet, Schwab does, in the most unimaginable way possible. The villains are so evil it’s palatable. I love that she takes risks that makes sense. She surprises me with each chapter. On thing I’ll appreciate is that the romance is not the center of this book. It’s nicely woven in, and really, just a glimpse of it made me swoon. It is enough to believe and cheer them on, and it does not twist characterization in any way. Her books reminds me of how the old YA books used to be. It’s about the story. While this puts an end to Kate and August’s story, I do hope we get a spin-off of this monstrous world. Audience: Older readers, be they teens or adults. Other recommendations: I’ve read and reviewed This Savage Song, which is the first book of The Monsters of Verity series. I’ve already read her fantasy series, A Darker Shade of Magic, A Gathering of Shadows, and A Conjuring of Light.